Momiji Health Care Society (Momiji) is the realization of a vision shared by its founders Mary and Roger Obata, Kazuo Oiye, Roy Shinobu, Fred Sasaki and Dr. Fred Sunahara. Momiji was established in 1978 as a not-for-profit, charitable organization for the Issei – the first generation of Japanese immigrants who came to eastern Canada – and specifically those who settled in the Toronto area post WWII. The initial program of Momiji was a Drop-In Centre, located at St. Christopher House, at Queen St. West and Bathurst Street, in downtown Toronto. Over the past 35 years we have grown to become the premier organization offering a wide range of services for seniors, for Nisei and post war immigrants, all over the Greater Toronto area and throughout southern Ontario. In 1992, after 14 years of raising funds and awareness, meeting with all levels of government, securing a building site and developing architectural plans, the doors opened at the newly constructed Momiji Centre. In 1998, a beautiful Japanese garden was established in celebration of Momiji’s 20th anniversary. The warmth of natural materials such as wood and stone, the sound of flowing water, the sunlight pouring through the Japanese maples that overlook the garden and patio all contribute to a sense of harmony and makes Momiji a joyful place. In 2009, Momiji was given the distinct honour of hosting their Majesties the Emperor and Empress of Japan during their tour of Canada. Today, Momiji has built strong relationships with many partners in the circle of care of its seniors and is recognized among community service organizations and hospitals for its efficient delivery of high-quality services. Do you want to learn about self massage technics for your pain by using Ayuveda? Ayuveda is one of the oldest holistic healing systems: it was developed more than 3,000 years ago in India. Facilitator: Ashwati Murali, Holistic Practitioner The sessions will be conducted in English and Japanese translation is available. For further information and registration, please contact Keiko Hoshi at 416-261-6683, ext. 249. The Castleview Wychwood Towers (Long-Term Care Facility) is a non-profit organization that accommodates our Japanese seniors with the friendly bilingual (Japanese and English) volunteers and staff. This tour will be conducted in both English and Japanese. We will meet at the lobby at 2:00pm. For further information, registration and transportation service, please contact Keiko Hoshi at 416-261-6683, ext. 249. Would you like to learn about GLA:D ( Exercise program from Denmark)? Improving your movements to reduce symptoms of hip and knee osteoarthritis so that you can return to the things you enjoy. Come ready to participate and practice a few simple exercises that will improve your movements. Facilitator: Rhona McGlasson RPT, MBA, National Lead GLA:D The sessions will be conducted in English and Japanese translation is available. For further information and registration, please contact Keiko Hoshi at 416-261-6683, ext.249. Inviting all seniors and their caregivers to explore Momiji facility and services. The tour will be conducted in English and Japanese. Tour contents : Facility tour, including all public areas of the Momiji Centre and one of the apartments. Information session about Momiji’s brief history, rental housing, application process, support service programs, meals & activity programs and Q&A. For further information and registration, please contact Keiko Hoshi at 416-261-6683, ext. 249. Momiji means maple in Japanese, and just as the maple is most beautiful in the fall, we believe our autumn years can be brilliant too. 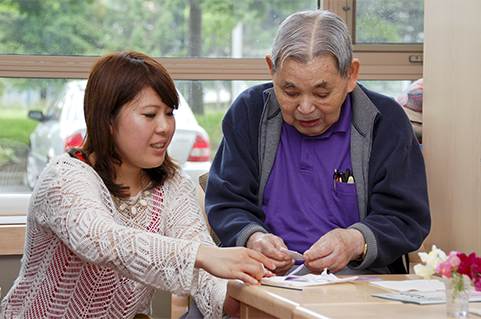 Momiji's philosophy of care is based on the commitment to offer respect, dignity and independence for our seniors. Copyright © 2019. Momiji Health Care Society. Funded by Ontario Seniors' Secretariat.